Mr. Karan Kaila, a student of M. M. Modi College won Gold Medal at Asia Cricket Cup (U-19) held at Dubai / Sharjah (UAE) from 26th Dec. 2013 to 4th Jan. 2014. India won this championship by defeating Pakistan Team by a margin of 40 runs. Mr. Karan Kaila has also been the Captain of the Punjab Cricket team (U-19) that won the KC Naidu Trophy held at Ahemdabaad (Gujarat) recently. On reaching the college, the students, the members of the staff and the Principal gave him a warm welcome. Dr. Khushvinder Kumar, Principal of the College applauded the achievements of the student and congratulated him. He further said that no educational institution can claim to have all round development without achieving higher goals in sports. Dr. Khushvinder Kumar assured the sports persons that they would be provided with excellent coaching and other necessary facilities in future also. 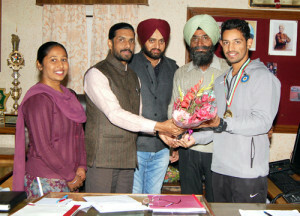 Dr. Gurdeep Singh Sandhu, Chairman, College Sports Committee, appreciated the achievements of Karan Kaila and said that this achievement has only been possible because of the hard work of Karan Kaila and the sincere efforts and able guidance of College Sports Officer S. Nishan Singh and Madam Mandeep Kaur.